Returning home from holidays with hundreds of others. Take a visit at other skywatchers today. Glad you are back home, and I love your Skywatch photo! This is a really great shot! Wish I was up there with you. Ah! This photo makes "Louis" wish he were once again on British Air Flight 284 from SFO to Heathrow, enroute to Paris! Great picture. 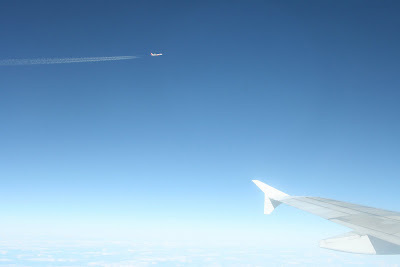 That looks like a Virgin Atlantic flight out there off of your wing. Moe: Cool shot with the other jet off your wing. Thats what you call a blue sky. I bet your pleased to see grey and murky after your holiday! Your are never alone in the sky.